Kinder Klub for girls – 5 years old – 55 minutes. Fun high energy classes for kids just entering or already in kindergarden. Basic gymnastics skills, movement exploration, fun strength building activities are all components of Kinder Klub classes. 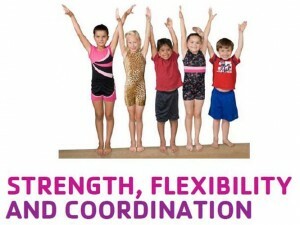 Beginners Classes are designed for children with very limited or no experience in gymnastics instruction or have had one semester of a gymnastics class. Your child will have a great time learning how to move gymnastically! Intermediate Classes build on the basic concepts and skills in beginning classes, and begin introducing more advanced skills on all apparatus. Children also begin connecting multiple skills together, and focusing more on form and how skills are performed. More time is also spent on increasing strength and flexibility. Advanced Classes continue to introduce gymnasts to more advanced skills and simple routines are taught. Execution of these skills while maintaining good body position is the primary focus. At this level gymnasts are encouraged to participate in local low-keyed performances / competitions.